Toady Bloysters (ツブラメケメクジ?, lit. : "Cute-eyed Kemekuji") are slug-like creatures found in Pikmin 2 and Pikmin 3. They creep along the ground in search of food, and upon discovering Pikmin, they emit a loud call reminiscent to that of a cow calf, then lash out their pseudopodia-like tentacles. Any Pikmin hit by the tentacles stick, and are ingested if the Bloyster is not killed before it can finish "chewing." As slow as they may be, a Bloyster is capable of causing a very large and sudden drop in the number of Pikmin a leader has at their disposal, should the player be careless enough to allow the Bloyster the chance. Its weak spot is a gill-like organ on its back. Although its body can be attacked for lesser damage in Pikmin 3, in the previous game, only the bulb can be attacked (even though it's possible to attack the body using Purple Pikmin). When it receives heavy damage, it shakes its tail and throws away any Pikmin hanging on to it in Pikmin 2, but merely ejects ink in Pikmin 3. This ink can temporarily and non-fatally choke any nearby Pikmin, but those hanging on the bulb will not be affected. In Pikmin 2, it has seven distinct tentacles, whereas in the sequel, it has one that splits into six. In the second game, a single Toady Bloyster spawns in the Perplexing Pool, and tends to rove around the shallows near the entrance to the Shower Room. When defeated, it typically drops two 10-Pellets in addition to the gill-like organ on its back, which is worth 25 Pikmin at any Onion. Entering any of the caves in the Perplexing Pool will trigger a respawn, making this Bloyster a particularly low-risk method of spawning large amounts of Pikmin in a short amount of time, potentially 45 Pikmin per Bloyster defeated. In Challenge Mode, a Toady Bloyster holds The Key on the first sublevel in The Giant's Bath. In Pikmin 3's Story Mode, one appears in the Garden of Hope, and one in the Twilight River. ↑ 500 HP on Shaded Garden (Battle Enemies) and Silver Lake (Battle Enemies). Particularly: I think this enemy does not actively chase Pikmin. Confirm and add. The best method of taking down a Toady Bloyster is simple; approach it from the back, and latch as many Pikmin as possible onto the gill-like organ protruding from its back. 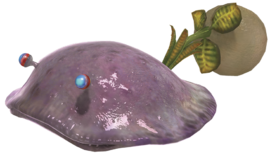 If you are feeling bold, you may instead decide to simply barrage the Bloyster in question with Purple Pikmin. Petrifying the Bloyster and following the petrification with a headlong assault works just as effectively as either of the two aforementioned methods, but due to requiring an ultra-bitter spray and not leaving a corpse, is recommended only if your Pikmin count is especially low, or if you wish to minimize any chances for casualties. The Toady Bloyster can be attacked by throwing Pikmin onto its bare, fleshy back instead of the gill-like protrusion on its back. If the Bloyster releases ink, just whistle the affected Pikmin back to you and continue the assault, and if you don't, they will not die and just become idle. Using an ultra-spicy spray proves to be effective as well. Throwing Pikmin at the gill organ, as stated before, will prevent them from being sprayed with ink, allowing just a few Pikmin to kill it in seconds. This is a helpful strategy, especially for Mission Mode. It can be noted that the Toady Bloyster found in at least Silver Lake and Shaded Garden on Battle enemies! mode are significantly weaker than the average one. Internally, in Pikmin 2, the Toady Bloyster is just a Ranging Bloyster, but some of the properties provide specific differences, and the hard-coded ability to be entranced by leaders is removed. "Toady" is a noun for someone who acts excessively obedient for someone else, like a minion. It could also reference the Toady Bloyster's toad-like profile, although "toady" is not normally an adjective. The Toady Bloyster's Japanese name is ツブラメケメクジ? (lit. : "Cute-eyed Kemekuji"). Its scientific name is Molluschid minionicus, in which minionicus is similar to the English word "minion". In Pikmin 2, it uses the internal name umimushiblind, which is the Ranging Bloyster's internal name, but with "blind" at the end of it, since it does not see the leaders' beacons. For Pikmin 3, the internal name was changed to kemekuji, which is part of its Japanese name. Official render of the Toady Bloyster from Pikmin 2. Toady Bloysters seen in the Piklopedia. A Toady Bloyster's tongue attack in Pikmin 2. Blue Pikmin battling a Toady Bloyster in Pikmin 2. The fully stretched-out tongue of the Toady Bloyster in Pikmin 3. A Toady Bloyster in Pikmin 3. A Toady Bloyster with its tongue out, but not stretched. Blue Pikmin attack a Toady Bloyster in Pikmin 3. The data file on the Toady Bloyster. Toady Bloysters are based on nudibranches, which are sea slugs that are very similar in appearance. In Pikmin 2, Toady Bloysters are one of three enemies not to appear in the Wistful Wild, the others being the Giant Breadbug and the Waterwraith. All three reside in the Perplexing Pool. The Toady Bloyster is the only one that is not defined as a boss enemy in the Piklopedia. In Pikmin 3, leaders can climb on top of Toady Bloysters by walking onto them from their backs. In both games, when a Toady Bloyster dies, its main body shrinks while the bulb stays the same size. Even though the body becomes very small, it's still possible to see in-game, using the closest zoom settings or the KopPad's camera. The same happens with the Ranging Bloyster. The Toady Bloyster's tiny body, visible in Pikmin 2. It's below the dash in the Pikmin counter. Click the image for a larger size. And in Pikmin 3. Here, it's below the central rectangle of the KopPad's camera. Click the image for a larger size. This page was last edited on February 16, 2019, at 16:38.